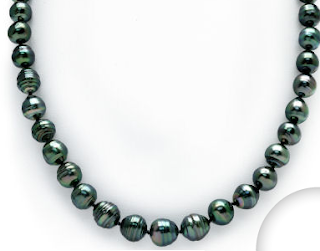 In Part Two, more on choosing a Tahitian pearl. 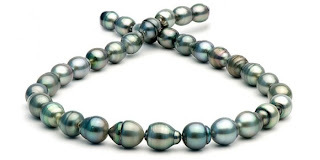 A woman showed me her necklace of dull black Tahitians, a gift from her husband who bought them in Hong Kong, and I wished to myself that he'd spent an hour researching pearl quality instead of reading his golf magazine. Lovely guy, sweet thought–and next time, even one fine pearl will be a wiser purchase. While few women will ever acquire 20mm baroque Tahitians like Keira Knightly's, we can educate ourselves by looking–so that every pearl we pick is a beauty. This is a pedestrian Tahitian, can you tell? It's characteristically dark, but that's about it. You can find this easily on eBay or in malls and tourist shops in Hong Kong and Polynesia. 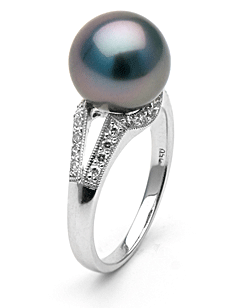 As a comparison, here's a Kamoka Tahitian pearl ring from Pearl Paradise (Price, $900, out of stock on web site but inquire if you are interested.) See the life, the blaze of orient, the majesty of the pearl? Circled pearls can be ringed anywhere on the pearl's circumference; where, how deeply and how extensively the pearl is circled makes a difference. I like the organic quality of light circling, if the colour and lustre of the pearl is beautiful. Circling is not considered a flaw, but it lowers the value. 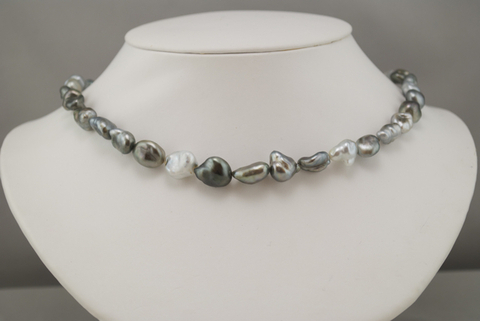 Look at the 9mm-10.8mm Tahitian baroque necklace from Pure Pearls, above. See how the circles are toward the end of the pearl? See the satiny lustre and aquamarine and steel blue overtones? Price for 18-inch necklace, $750. Here's a detail of a much more heavily-circled pearl necklace ($799) from another vendor. Not my choice, but some might like it. When looking online, your monitor may make pearls look lighter or darker than in pearl-person. Overtones or orient are most evident in full natural light, so examine the pearls you receive in sunny daylight. A phone chat first is a good idea to determine, for example, if overtones are evident on all pearls or if the photo is the exact strand you will be sent. Keshis, the all-nacre pearl, are also found in Tahitian varieties. They're a delightful way to wear the Tahitian palette, and the lustre and colour can exceed the nucleated variety. Kojima Company offer this 17.5 inch (unstrung) strand of 7.5mm-10mm keshis; price, $952. Somebody is going to get upset now, but chocolate Tahitian pearls are not something I'd pray for, even though chocolate anything gets most women's attention faster than George Clooney in a towel. Tahitian pearls are produced by the black-lipped Pinctada Margaritifera oyster; they do create taupe pearls, more grey than brown, and a natural brown that is actually black with bronze overtone. I've seen one natural chocolate-coloured pearl, but the colour was present only one one side. The chocolate variety marketed currently are, according to the Gemological Institute of America (GIA), created: "the 'chocolate' color is obtained using a bleaching process and heating applied to fancy-colored Tahitian pearls." Pearl guru Jeremy Shepherd of Pearl Paradise notes that there are two ways of creating chocolate pearls: by either adding or removing colour. All you have to remember: a chocolate pearl is a treated pearl. Any treatment should be disclosed by the vendor (as Pearl Paradise does). Some sites call them "enhanced", preferring to evade the words dyed or bleached, but that's what they are unless they specify "natural colour". Then, it's a matter of taste. I prefer natural-coloured Tahitians, even one, to a strand of these pearls, but they have their fans. The chocolate necklace shown above, from Pearl Paradise, is $2,600. Tilda Swinton's opera length (26-36 inches) shown yesterday flatters her narrow, small-busted, long-necked torso. More voluptuous women look better in princess length necklaces that sit at or just below the collarbone (17-19 inches), the shorter end of matineé length (20-25 inches) or long ropes (42 inches or longer) that hang nearly to the waist to avoid the garland-off-the-prow effect. I'm wearing a 20-inch necklace, because all the coconuts are not in Polynesia. 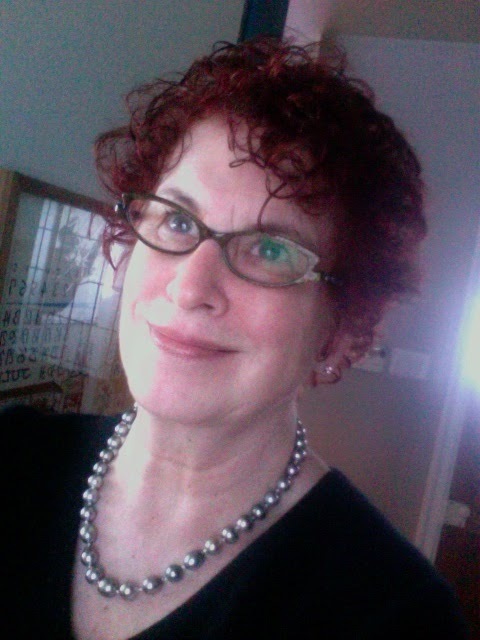 If you want a 16-inch choker, considering buying six or eight extra pearls because one day you might be fleshier in the neck and finding matching pearls to add length will be a bear. Here's a description of various lengths with photos from Pearl Paradise. 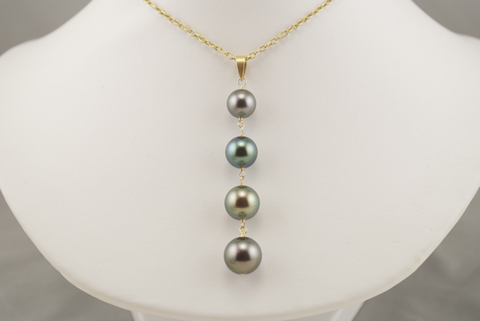 This four-pearl Tahitian pendant from Kojima Company, $470, shows a spectacular array of Tahitian hues. Hang this on your chain or cord, play with various lengths, even layer it. The 10mm Pearl Paradise pendant, $285 (with white or yellow gold chain) comes in the two standard lengths but can be special-ordered longer. Pearls from Polynesian lagoons, glowing treasures. My first encounter was at a jeweler's salon ca. 1982. He displayed the various colours on hatpin-like stands, each pearl a gift from the sea. I wandered in, left awe-struck, and have remained so ever since. Wonderful post on necklace length and why. "Garland off the prow." hee hee what a great description of that particular concern. That last single pearl is similar to my Tahitian. Oh, that single is delicious! My mom brought back a kidney-bean shaped pearl ("normal" color) from Shanghai that's strung that way. It's stunning! I had a tutorial about necklace length when I took my squash-blossom necklace in for restringing and cleaning -- the woman who runs the shop asked me if I wanted to shorten it. We only took off a few beads, but what a difference! It hits me at the most flattering place and not, as the grandmother from whom I inherited it used to say, "at the crest of my bosom." Thanks for this post. Very educational--especially about the most flattering necklace lengths. Ah, these are such a visual treat! Thank you Duchesse for once again sharing your pearl expertise. And "George Clooney in a towel," heh. Natasha: He did? Good boy! Susan: Necklace lengths are also influenced by size of pearl so it's a good idea to try even lengths to which you are not accustomed. 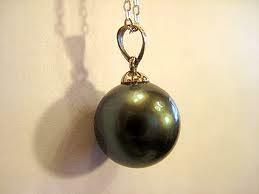 I have my share of pearls; some South Seas well over $50K, and I still want chocolate pearls. They're the only colour I lack in my collection. Most of my pearls have been purchased from Katsuyama Pearls. The owner is a personal friend who is now retired. He mentioned that China is now producing some nice pearls. thedutchessofH: As I said, chocolate pearls will appeal to some, and you will not have to spend as much as your South Seas to complete your collection.